In an investment newsletter called Money Morning on April 9, Martin Hutchinson pointed to disturbing parallels between current government monetary policy and Weimar Germany’s, when 50% of government spending was being funded by seigniorage – merely printing money. However, there is something puzzling in his data. He indicates that the British government is already funding more of its budget by seigniorage than Weimar Germany did at the height of its massive hyperinflation; yet the pound is still holding its own, under circumstances said to have caused the complete destruction of the German mark. Something else must have been responsible for the mark’s collapse besides mere money-printing to meet the government’s budget, but what? And are we threatened by the same risk today? Let’s take a closer look at the data. So begins an article by Ellen Hodgson Brown, author of "Web of Debt", titled TIME TO GET OUT THE WHEELBARROWS? 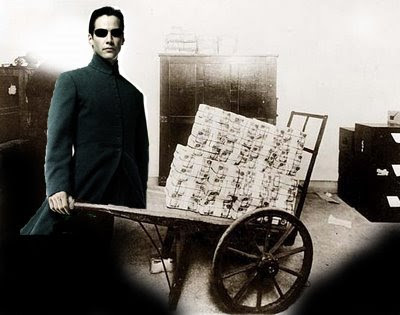 ANOTHER LOOK AT THE WEIMAR HYPERINFLATION. In it she very nicely lays out the case that the Weimar hyperinflation is misunderstood. She explains that in the Weimar Republic of 1923 the mark collapsed to one-trillionth of its value just 9 years earlier. She then points out that no one claims the hyperinflation was CAUSED by a trillion times dilution of the mark, so the cause can not be as simple as supply and demand. Something else must have happened. What actually drove the wartime inflation into hyperinflation, said Schacht, was speculation by foreign investors, who would bet on the mark’s decreasing value by selling it short. At first, the speculation was fed by the Reichsbank (the German central bank), which had recently been privatized. But when the Reichsbank could no longer keep up with the voracious demand for marks, other private banks were allowed to create them out of nothing and lend them at interest as well. While Hitler clearly deserves the opprobrium heaped on him for his later atrocities, he was enormously popular with his own people, at least for a time. This was evidently because he rescued Germany from the throes of a worldwide depression – and he did it through a plan of public works paid for with currency generated by the government itself. Projects were first earmarked for funding, including flood control, repair of public buildings and private residences, and construction of new buildings, roads, bridges, canals, and port facilities. The projected cost of the various programs was fixed at one billion units of the national currency. One billion non-inflationary bills of exchange called Labor Treasury Certificates were then issued against this cost. Millions of people were put to work on these projects, and the workers were paid with the Treasury Certificates. The workers then spent the certificates on goods and services, creating more jobs for more people. These certificates were not actually debt-free but were issued as bonds, and the government paid interest on them to the bearers. But the certificates circulated as money and were renewable indefinitely, making them a de facto currency; and they avoided the need to borrow from international lenders or to pay off international debts. The Treasury Certificates did not trade on foreign currency markets, so they were beyond the reach of the currency speculators. They could not be sold short because there was no one to sell them to, so they retained their value. Within two years, Germany’s unemployment problem had been solved and the country was back on its feet. The dramatic difference in the results of Germany’s two money-printing experiments was a direct result of the uses to which the money was put. Price inflation results when “demand” (money) increases more than “supply” (goods and services), driving prices up; and in the experiment of the 1930s, new money was created for the purpose of funding productivity, so supply and demand increased together and prices remained stable. Hitler said, “For every mark issued, we required the equivalent of a mark’s worth of work done, or goods produced.” In the hyperinflationary disaster of 1923, on the other hand, money was printed merely to pay off speculators, causing demand to shoot up while supply remained fixed. The result was not just inflation but hyperinflation, since the speculation went wild, triggering rampant tulip-bubble-style mania and panic. This was also true in Zimbabwe, a dramatic contemporary example of runaway inflation. The crisis dated back to 2001, when Zimbabwe defaulted on its loans and the IMF refused to make the usual accommodations, including refinancing and loan forgiveness. Apparently, the IMF’s intention was to punish the country for political policies of which it disapproved, including land reform measures that involved reclaiming the lands of wealthy landowners. Zimbabwe’s credit was ruined and it could not get loans elsewhere, so the government resorted to issuing its own national currency and using the money to buy U.S. dollars on the foreign-exchange market. These dollars were then used to pay the IMF and regain the country’s credit rating. According to a statement by the Zimbabwe central bank, the hyperinflation was caused by speculators who manipulated the foreign-exchange market, charging exorbitant rates for U.S. dollars, causing a drastic devaluation of the Zimbabwe currency. The government’s real mistake, however, may have been in playing the IMF’s game at all. Rather than using its national currency to buy foreign fiat money to pay foreign lenders, it could have followed the lead of Abraham Lincoln and the American colonists and issued its own currency to pay for the production of goods and services for its own people. Inflation would then have been avoided, because supply would have kept up with demand; and the currency would have served the local economy rather than being siphoned off by speculators. The $12.9 billion in bailout funds funneled through AIG to pay Goldman Sachs for its highly speculative credit default swaps is just one egregious example. To the extent that the money generated by “quantitative easing” is being sucked into the black hole of paying off these speculative derivative bets, we could indeed be on the Weimar road and there is real cause for alarm. Using quantitative easing to fund infrastructure and other productive projects, as in President Obama’s stimulus package, could invigorate the economy as promised, producing the sort of abundance reported by Benjamin Franklin in America’s flourishing early years. We have been led to believe that we must prop up a zombie Wall Street banking behemoth because without it we would have no credit system, but that is not true. There is another viable alternative, and it may prove to be our only viable alternative. We can beat Wall Street at its own game, by forming publicly-owned banks that issue the full faith and credit of the United States not for private speculative profit but as a public service, for the benefit of the United States and its people. So, to summarize, it is not the government's reckless deficit spending that causes hyperinflation, but the evil speculators that drive down the value of paper currency through short selling, and the evil private banks that pay off the CORRECT bets on paper being worth... well... what paper is worth. NOTHING. Here is where Ellen Brown gets it wrong. By relying on the fundamentals of supply and demand, she equates the value of a paper currency to the value of the real goods it buys. And she believes this equation is real. Therefore, all that is needed is for economic goods to increase at the same rate as worthless paper. That, and of course the hog-tying of the evil speculators. The reality is that the monetary base of dollars does not need to be increased a trillion times for the dollar's value to drop to one-trillionth. The reality is that the paper (or digital) dollar is really only worth that already. The fact that we can still buy real goods with our dollars is the result of the façade or "matrix" that has been built. But this façade is now crumbling. The speculative bets are not the disease. They are simply the visible symptom of the disease. The disease is the purely symbolic currency we trade for real goods from all over the world. Think of this from a medical perspective. To only attack the symptom of a deadly disease, or worse, to believe the symptom IS the disease, is a sure way to a quick death. This is where the dollar is going. And the many misconceptions about hyperinflation that are circulating on the internet ensure that death will at least be quick, even if it is not painless. If this is after the Matrix reloaded as suggested by leap2020, you might be correct: we are likely to see lots of fighting scenes that do not really make a difference, as everything is already decided. If you stand back far enough from the chaos you can see that the pattern has already emerged. If you look too closely at the chaos you will never see it. You will be confused by the eddies in the river that seem to make the water flow upstream. But from the mountain top you can clearly see that the river flows in only one direction, toward the waterfall. Thx for your comment 2:42 who is a wise & powerfull parable ! If Ms. Brown were correct, then ACORN could have been fabulously successful and self-perpetuating by using the Government largesse to fund inner city loans themselves, instead of using the money to build a criminal blackmail enterprise. Under Ms. Brown's premise, the GSE's should be not only solvent, but a shining beacon of benevolent Government partnership. Who is John Galt. If I'm correct freegold would mean that individuals are no longer dependent on any central power for preserving their wealth, hence it would be a system that truly allows for individual (financial) freedom. Has such a system ever existed before in history, as far as you know? At what point does inflation turn to hyper-inflation from a percentage standpoint? IE: is a 25% inflation rate hype inflation or is the percentage higher than that? Here is a good roundtable discussion with the gold experts. It's a bit outdated, but it is very applicable. The mentioned gold at 630 at the high at the time. Good video. It is the second segment of a roundtable discussion at the 2007 Vancouver Resource Investment Conference. The first segment is good too. And they are even more relevant today. Some of the things they say in part 2 are even more amazing because of the date they said them. The video was recorded on Jan. 22, 2007, just before the peak of Martin Armstrong's cycle, 2007.15. Segment 1 is mostly about manipulations in the markets and the PPT. 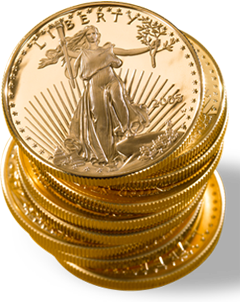 The gold market, currency markets and even the Dow manipulations. Very good discussion. More apt today than when it was recorded. Segment 2 is about why to own gold, the future prospects of gold, the Dow/gold ratio and so on. It also contains some very prescient predictions about the ongoing collapse that had yet to begin in January, 2007. Imagine that you possess a small family heirloom, of the size that you can hold in your hands. It is worth $10 million in today's dollars. Or, let's say it is worth 20 large houses. But you wish to sell it and deploy this wealth into your life. Now is one of the only times in all of history that you must pass through the unsettling transient state of pure fiat, pure faith in a central power to preserve your wealth, until you deploy it into your life. How long would you feel comfortable leaving your wealth in this state? One day? One week? "Has such a system ever existed before in history, as far as you know?" I think you ask the wrong question. Very clear. Highly persuasive. Probably useful. But beware overconfidence.